In fact, I'd pay good money and lots of it, to spend an evening with him in Skidrow on Sea and be there watching when he insults, face to face and not through his keyboard, the more hetreo men and non-hetero wimmin Leave voting residents there the way he insults people on here. Based on a weekend I spent there last year, attending a wedding, we'd probably end up having to take him to the local A&E with a face that would make even Paul Pogba look like an anemic Celt. Wow, you're really going for the full Brexit violent fantasy there. Imagine being this consumed by hatred, how it must burn you up inside. I couldn't live like that but whatever floats your bateau. Anyway, in more good news, Parliament has just taken control of the order paper from the government. May's strategy in tatters. The rage in here will be a sight to witness. Go with that too. Now If the chap in our village who said the French want out and do something about it, short of actually leaving, things could get really interesting and justify leaving. The chap in your village knows a thing or two....Although like last time they would just ignore the result. Following a bloodless coup against the elected leader of the country the triumvirate in control of the governing committee of 600 has chosen to ignore the results of a national referendum that was held two years ago and to which it had been committed. A representative of the triumvirate said in a statement today that having wrestled control of the referendum issue away from the first minister it would now proceed with its own agenda which would be aimed at thwarting the result of the referendum. Strikes me that you don't need Jeremy Corbyn in power to propel Venezuelan politics into British homes and gardens. Makes you proud to have a red passport I suppose? While we are on the subject of opinion polls latest news. Only 6% think Brexit has been handled well. 55% want to Remain. I have often thought that any election or referendum should be immediately followed by another vote (on the same topics) - to even out those who were voting without thinking - ie when they saw the result of the first vote they might realise what they had done . . .
Good idea but maybe limit to close results, say 2-4000 votes. Out of the 6,000 people questioned. 6,000 is a big number for a normal political opinion poll. If you look back over time you'll see that normal the figure is in the range 1,000 to 1,500. There have been few in recent times where the numbers questioned have been in excess of 20,000 but they are very much in the minority. As usual, and I must have said this time and time again, polls and the answers they provide are dependent on the questions and how they are asked, and that is guided by the person or organisations that are paying for the research. For those that think last night moved us any further forward. Indicative votes are not binding and TM has stated she will disregard anything which contradicts the Conservative manifesto at the last election - which ruled out a Customs Union. Parliament can can attempt to push through Brexit legislation, but the government can stop any such attempt by withholding Royal Consent. They can also veto any attempt to repeal the current WA the same way. The EU will not agree to a further extension past 12 April unless there is a definite plan, such as for an election or referendum. The government will not agree to a referendum. An election under the FTP Act, unless passed by 66% of MPs, would not be confirmed till after the the passing of a vote of NC followed by an pause of 14 days. In short, TM can still stall until 48 hours before Brexit and present the HoC with the option of her deal or no-deal. They haven't given up on that pre-EU stuff, have they? An early election would need to be "passed by 66% of MPs". Can anyone think of 66% of MPs who would not be absolutely terrified at that idea of having to face their electorates with they way the public are currently viewing Parliament? A General Election (a genuine "peoples' vote") would be the best way of clearing out that rotten House, but I cannot see it happening. What they are going to do instead is make sure that they become even more discredited in the eyes of everyone viewing them from outside their 'village'. As I suggested over on another thread, just run the binary yes or no referendum again but this time allocate the 'didn't vote' numbers to a default 'yes' or 'no'. That way every vote counts, not just about half of those that can be bothered to vote. I'm afraid that won't quite cut the cake. TM can say that all she likes to justify her position but you may recall the last Conservative manifesto contained a dementia tax without a cap. A previous Conservative administration stood on a manifesto with something called the community charge. Whatever happened to that government? Either way, the argument contravening a manifesto pledge is unacceptable is as hollow as a cave. Parliament has taken control of business from a broken government & all that remains for the administration to wrest back control is self immolation OR put the frighteners on the ERG & DUP to the extent they back the PM. May can, and has said many things. "We're leaving the EU on 29th March 2019" was one; "Brexit means Brexit" is another and she's said one thing one day, and done something else the next on more occasions than a few. I'm sure you're right, she could do any or all of the things you have mentioned to block MPs from getting their preferred (or least disliked) Brexit but in reality, were she to block, say a Brexit with customs union, and then the UK subsequently fall out of the EU on 12th April with no deal who would the public blame? The MPs who tried to get us out of this mess, or the PM and Tories who blocked it for internal party reasons? I believe if the government lead us out for the EU with no deal, the Tories will still implode. There a number of sane MPs within the Tories who appreciate that the economy, public finances and the population's wellbeing are more important than attaining a pure Brexit and will leave the party if we crash out. 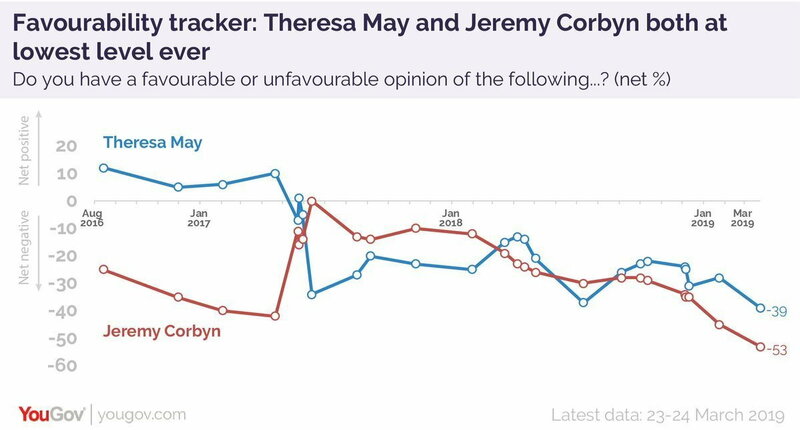 Either way, however Brexit is resolved, the current two party system appears doomed, as Labour will likely suffer similar issues especially with Corbyn at the helm. No whatifery please, just the facts as they stand right now. Today, it's 29th March; by the end of the week it's expected to be 12th April. On the 11th of April?? I suggest you consult Mr Blobby! If you had fairly divided those 'did not vote' numbers between leave and remain i.e. 50% to each, surely leave would still have won with the exact same percentage difference as they actually did.